Prime Minister Imran Khan is resolute about completing Karachi’s ongoing mega projects that were started by the previous PML-N government, SAMAA reported Sunday. 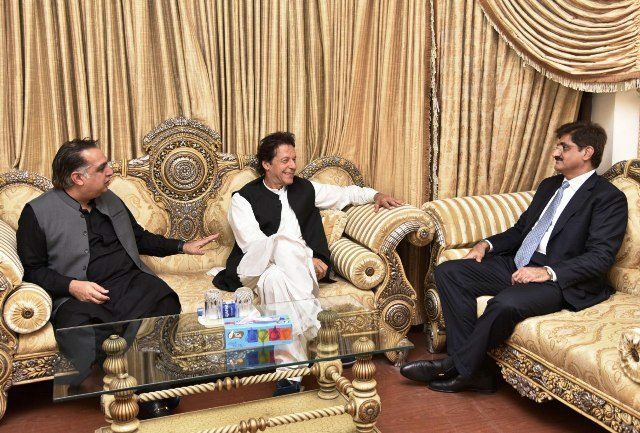 The PM has assured the Sindh and Karachi city administrations of his complete cooperation for the completion of the Green Line mass transit project, K-IV drinking water project and S-III sewerage plan. All the mega uplift projects are jointly carried out by the federal and Sindh governments. Imran Khan assured this as he visited Karachi for one day on his first official visit to the city since taking office. The PM was briefed on the progress made so far on the projects. Mayor Wasim Akhtar briefed him on the projects and informed him which ones are nearing completion. The PM directed the authorities to complete the ongoing development projects at the earliest. In a separate meeting, a delegation of the Muttahida Qaumi Movement Pakistan urged the PM to release Rs.500 billion for Karachi. However, the PM did not announce any financial package for the multi-billion rupee schemes. The groundbreaking for the 109 km Green Line project took place in February 2016. It was set to be completed in 2017, but it could not be completed by 2018 due to the tug-of-war between the PMLN-led former federal government and the PPP’s Sindh governments. Former Prime Minister Nawaz Sharif announced the completion of the first phase of the project – from Surjani Town to Numaish Chowrangi, saying that the second phase – from Numaish to Merewether Tower – would finish by the end of 2018. The federal government considered the project completed while the Sindh government said the project is incomplete. People are suffering as the bus corridor still stands unfinished. In a separate meeting, the premier was briefed by the Sindh chief secretary on the security situation. The meeting was attended by the Rangers director-general, Karachi corps commander, Sindh IG, chief minister, governor and other officials. He was told that the Karachi operation has eliminated almost 90 percent of major crimes in the city. The Rangers-led operation was started in 2013 in Karachi. Imran Khan said there will be no compromise when it comes to peace in Karachi, according to our correspondent. 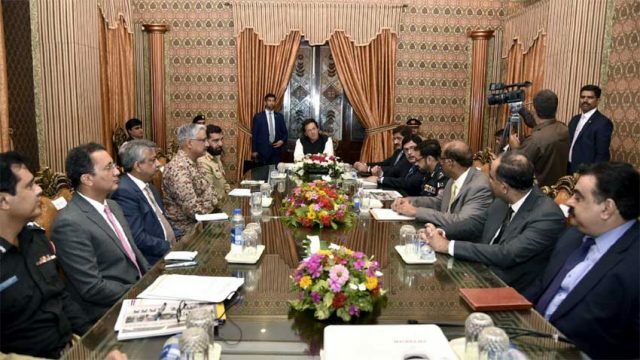 Prime Minister Imran Khan has told officials in Sindh to work harder to eliminate street crime in the province. Any economic development is impossible without peace. We will assist the provincial government in maintain the law and order, he said. He lauded the role of police and Rangers in establishing peace in Karachi.